Molecular Maya (mMaya) is a free plugin for Autodesk Maya that lets users import, model and animate molecular structures. 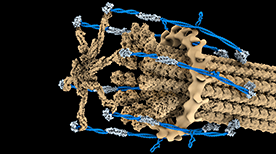 We leverage the power and flexibility of Maya while offering innovative, intuitive tools specialized for the challenges of molecular modeling and animation. 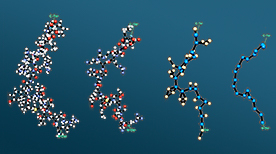 mMaya is further enhanced by a series of 'kits' that expand its functionality and greatly streamline molecular modeling, animation, and simulation (see below). (note that we do not recommend switching/upgrading mMaya or mMaya kit versions within projects as scene files created with older version may not be entirely compatible with new versions). in an already open Maya session, drag the scene file from your file browser in/on to the Maya window. 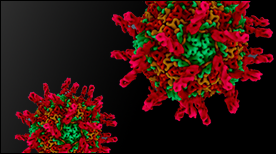 Molecular Maya's Modeling kit enables the rapid and intuitive creation of structurally accurate and simulation-ready macromolecular models. Many if not most 3D structures in databases such as the PDB are incomplete and, although primary structure is often known, truncations and gaps are common occurrences. The mMaya Modeling kit facilitates the creation of full-length molecular models by automating the process of finding and filling such gaps, giving the user control over secondary structure and dynamic control over posing newly synthesized polypeptide chains. The kit also provides easy chain alignment, splitting and PDB export tools, as well as a library of common protein domains to streamline the molecular modeling process. Click here for instructions on how to install a kit after purchasing. 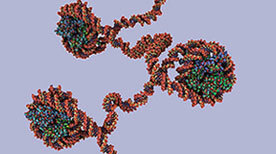 Molecular Maya's Rigging kit enables single-click creation of complex dynamic molecular rigs. With drop-down menu simplicity, users can generate various levels of rig detail, from all-atom rigs, to more coarse-grained options (including no hydrogen or alpha-carbon/backbone-only rigs). The kit offers multiple options for molecular representations that are tied to the underlying rigs, so you can visualize your protein in atomic, backbone or surface mesh representations while visualizing a simulation. We have also included a number of powerful tools to give you fine control over your rig: these include subdomain selections and rig handles to steer your simulated model, automated creation of elastic-networks to maintain secondary structure, and controlling collisions with other models. The kit also lets you fine-tune the strength of these additional rig controls as they respond to the dynamic properties of your simulation environment. Finally we have also included a number of options to facilitate morphing between conformations - either using a single PDB as a target or multiple conformations found in an NMR ensemble. This kit is must-have to simplify your animation and simulation workflow, especially when used in combination with the mMaya Import and Modeling kits. To take full advantage of mMaya's Rigging kit, please visit the Clarafi course Introduction to Molecular Maya's Rigging Kit documenting its capabilities and creative uses in production. Molecular Maya's double-stranded DNA (dsDNA) kit automates the modeling, animation and visualization of structurally-accurate dsDNA. Starting from either DNA sequence or custom- and/or PDB-derived curve coordinates, this kit rapidly creates animation- and simulation-ready models with the click of a button. Users can easily apply 'strand mounts' that facilitate the binding and animation of proteins interacting with the dynamic DNA models. dsDNA strands are also cleavable at specific sequence locations and come with options to fine tune their local dynamics. To take full advantage of mMaya's dsDNA kit, please visit the Clarafi course Introduction to Molecular Maya's dsDNA Kit documenting its capabilities and creative uses in production. "Beautiful, accurate models of DNA are now available on the ground floor for everyone. With this kind of foundation for biomedical visualizations, it is mind-boggling to speculate on what's now possible and what's coming next." Molecular Maya's Cytoskeleton kit enables intuitive and rapid modeling of structurally-accurate actin or microtubule fibers (an intermediate filament model is also included). Deformable models are created either from user-generated curves or using a procedural modeling 'volume populator' approach. Users can customize 'level of detail' (LOD) controls for fiber geometry and curve fitting , which leads to efficient viewport handling, 'a must' for the manipulation of large fiber arrays. 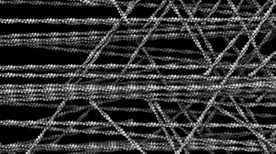 Strand mounts allow users to bind and move elements along individual fibers to facilitate animation of cytoskeleton-interacting proteins.